GOOD GIRLS REVOLT is one of the best feminist shows out there. Aside from the obvious potential in the plotline of women filing a lawsuit in demand for equal compensation and opportunity at work, each of the characters truly learns why they need to see themselves as equal to men in order to achieve their full potential. Much akin to the girls in GIRLS, GOOD GIRLS REVOLT has a cast of strong, complex women that makes the show thrive. 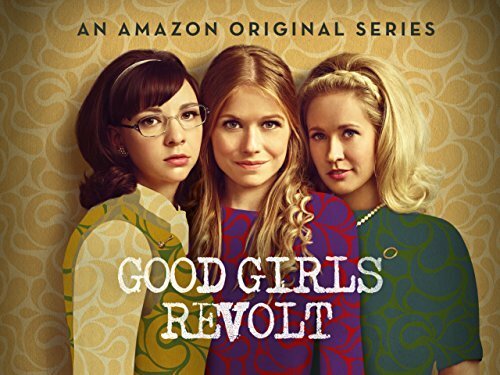 A good place to begin with GOOD GIRLS REVOLT would be its source material, the novel “The Good Girls Revolt” by Lynn Povich, which follows the 1970 lawsuit against Newsweek Magazine after preventing their female researchers to write or become editors. The show focuses on the fictitious News of the Week magazine, as Patti Robinson and her fellow co-workers, Cindy Reston and Jane Hollander, discover that their company is illegally limiting them from fulfilling their dreams because of the patriarchy rampant in the work culture of the day. Patti, Cindy, and Jane all start out stuck in the world laid out for them. They are all in what they believe to be normal, loving relationships. Patti, the most radical of the bunch to begin with, is happy with her job and her boyfriend. Cindy, the most naive, has been following the rules all her life, enjoying her mundane work and living with her husband, and awaiting the proper time to start a family. Jane also doesn’t believe that she was destined to be a career girl, as she prides herself on always turning in a job well done without complaint, eagerly expecting her boyfriend to propose. GOOD GIRLS REVOLT focuses more so on the characters rather than the lawsuit itself; surprisingly, it’s not even filed until the last episode. This means that the greater portion of the series is spent depicting the characters: who they are and how they all banded together towards this one cause, coming from all different walks of life. They eventually realize that despite their many differences, they are still prone to the rampant sexism in their society, and unite to fight it. Starting the show one could simply expect badass girls getting things done and fighting for what they believe in against all odds, with men as their enemy. But that’s not GOOD GIRLS REVOLT. This show is real. Even though the girls want more than anything to be more than what they are, they still have their doubts. Cindy only ever does what she wants when she drinks alcohol, and Patti always manages to feel guilty for going against the men in her life. Jane takes back her admittance of “always being a career girl” and only reaffirms that statement after she tries to play the system “by the rules” to no avail. The ultimate goal of the girls was not really to just file a lawsuit against their employers at risk of termination, but to turn against the men that have subtly been dictating their entire lives. Even though Cindy believes throughout the entire show that she is doing everything of her own accord, by the end of the show she realizes she has only turned to Ned for a sense of belonging instead of her husband. There’s also a side of the women’s rights movement that hasn’t been explored that often in film or television. To a modern-day audience, the sexism in their society is obvious. However, none of the women themselves realize it at the start. And it’s not like a light switch immediately goes off in their heads either; each of the girls waver back and forth between their societal templates and their true selves. The unprecedented real problem the show addresses is how women can feel subconsciously guilty about going against the norm, and GOOD GIRLS REVOLT thrives off the resulting drama. Furthermore, the male dominance in the office is portrayed in a subtle, yet profound manner that speaks louder than any bit of dialogue. In one episode, a reporter is on the hire for a new researcher, and all the men in the office joke about him picking someone beautiful. He interviews and chooses a woman who has a 26 inch waist, and is taken aback when she shows up on the first day and he finds out that she is black. He eventually falls for her, and kisses her on New Year’s Eve, to no response from her at all. The men in the office are always expecting more. Does this look like the face of a girl happy after her New Year’s kiss? So when Jane tells the girls that she can become a writer by “playing by the rules,” she attempts to get on the editor’s good side, which only leads to being harassed by him, with no writing position in the end. This is what causes Jane to acknowledge the problem of sexism, and she dives into the lawsuit head first as a result. The show ends with all the girls preparing for a press conference. All the girls are released from the oppressive male chains that have dictated their entire lives, free at last. Once all of the women are opposing the men, it is clear that they have been holding them back, and not one of them is feeling any bit of remorse about it. That is GOOD GIRLS REVOLT. It’s demonstrating women’s willpower and determination when they’re faced against the blatant sexism in their work and home lives. I’m not going to compare this show to MAD MEN. It’s tired. Comparing the two would be comparing THE OFFICE to PARKS AND RECREATION: Both are mockumentary workplace comedies, but both of them are appreciated for their differences. Both MAD MEN and GOOD GIRLS REVOLT are set in similar time periods, with similar settings and similar social norms. But they are both good at what they do. GOOD GIRLS REVOLT is great at providing insight into a changing time and the girls that change with it. Michelle is a guest contributor for Crossfader Magazine. She self-published a book about fairies when she was eight. It sold two copies.